"The 57 words in this book along with John Di Lemme's Closing and Marketing strategies have radically changed my life and exploded my results in business. I now confidently market my business without wasting money on useless ads or marketing that simply doesn't work. My business has quadrupled! Thanks John for these 57 Must Use Words...they really work!" Enter Your Email Now For INSTANT Access To The FREE eBook + The Bonus Audio Book! "Four years ago I was lost, confused, frustrated, and didn't know what to do next in my business. Through John's teachings and mentorship he has taught me how to build my self-belief, self-confidence, and self-worthiness and to accept who I truly am which lays the foundation to implement strategic marketing. Plus I’ve earned the most income in my 9 years of my Oriental Medicine business as well as being in the best physical health in my life! John has built a caring, trusting, supportive, and safe community where we as his students can dream big and achieve our goals. John is an enthusiastic motivator and a marketing genius!" "I have gleaned so much wisdom from John Di Lemme’s proven, millionaire business strategies. I am growing emotionally stronger plus my business has grown by 7,000% and my income has increased 500%!" 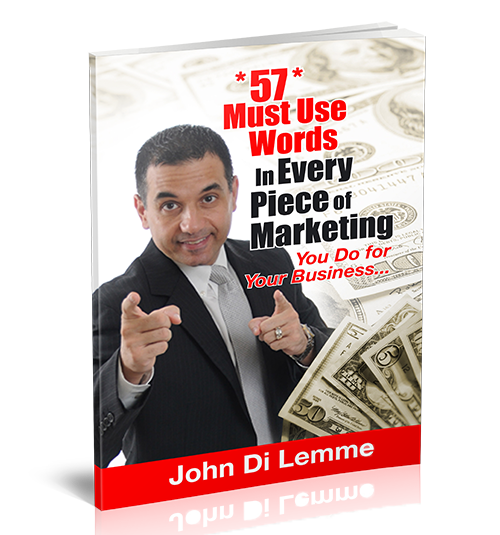 "The 57 Must Use Words Marketing book is the best book that I've ever read. I started highlighting just the key points only to look down and see that the whole page was bright yellow. Everything in this book is key to my success! These words will easily generate millions of dollars in my business and any business. Everyone can discover the truth about marketing from this book and explode their business. I am convinced that John Di Lemme is the foremost expert in Closing and Marketing." "I use the words in this book throughout my entire business. They have given me insight on not only how to market myself, but also determine exactly what my clients want. These powerful words are also mandatory for all of my office team so they understand the importance of the words that we use with our customers and in our marketing." Enter Your Email Below To Get Access To Your FREE Book! © Copyright 2017. All Rights Reserved. Di Lemme Development Group.